Today I'm having some of this tea my mom brought me from Colorado when she was here for a visit. It came from our friend Bernideen's shop in Old Colorado Springs, which we visited when I was out there in March. Not only is the tea in pretty packaging, it tastes delicious, too. My mom also brought out this gorgeous, vintage quilt. 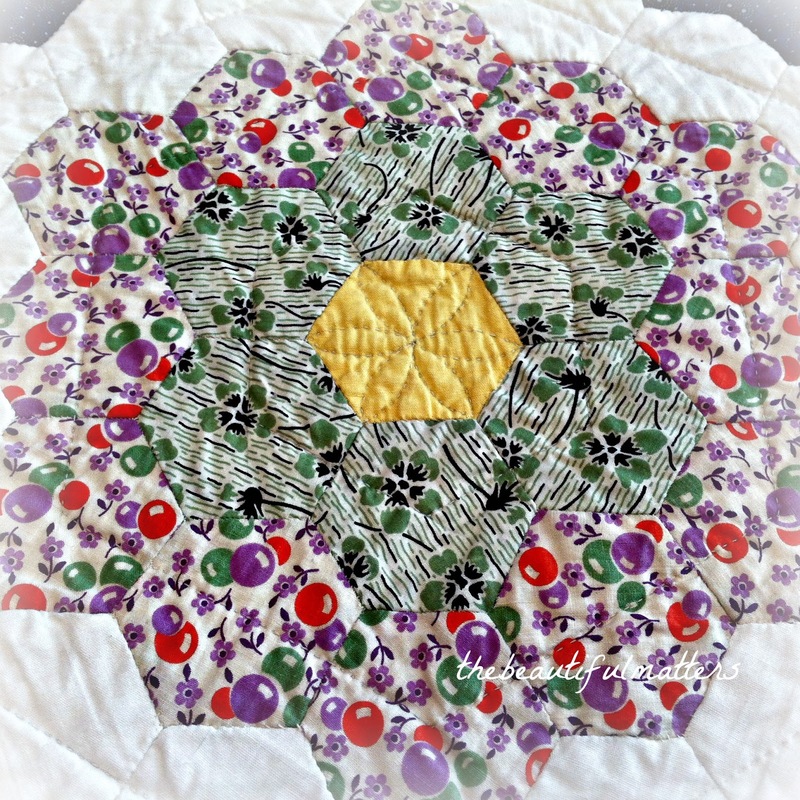 The hexagons (hexies, as quilters call them) were put together by my great-aunt back in the 1950s. My mom assembled it all about 15 years ago. Check out these fun retro prints! No treats today with tea, because last night I had a piece of this chocolate raspberry cake. Yummy! Here's a pic taken of us at our youngest son's graduation last week from Hillsdale College. Also shown with my husband and I are our daughter and oldest son. Daughter-in-law has a new job, so wasn't able to attend. Oh, and a p.s. I just acquired 71 -- yes, 71!, books this past weekend at a huge library book sale. My bookshelves are rapidly filling up. Got some real treasures. Hello Deborah, the tea must if been good and I love the quilt. Congrats to your son graduating college! What a nice photo of your family! You must be so proud of your son. Boy are you lucky to have so many books. Happy reading and enjoy the week. How nice that you were able to visit Bernideen's store before she closed shop for good! The quilt is a beautiful family heirloom. Congrats on your son's college graduation! Congratulations on your son's graduation, well done. The quilt looks wonderful, a real delight. Wonderful family photo! Congrats to your son. I see some honors hanging round his neck. Your mother brought some wonderful gifts. The quilt is amazing. The tea sounds wonderful, Deborah, and I fancy the names of them. 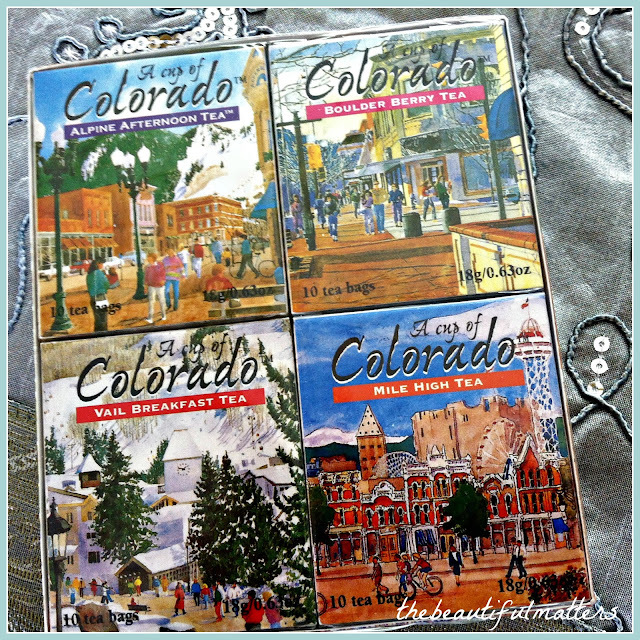 I am intrigued with anything pertaining to Colorado right now because my son will be going there to the university in the Fall. Congratulations to your son too! A happy occasion and the picture of you all is really delightful. You, by the way, look terrific! Thank you for joining me for tea this week and enjoy your day. Oh, I forgot to mention how much I like the quilt. Quilts fascinate me, partly because of the love and workmanship that goes into them. Nice to have! Deborah, missed you while you were gone! You're looking great in the photo, and I love your quilt, a treasure indeed. Oops, I forgot to extend congrats to your son on his graduation, and to you & your husband. Empty nest?! Congratulations to your son, Deborah! I loved the family photo...what a beautiful group!! The teas sound wonderful from our friend, Bernideen's, shop. The quilt is really a treasure for sure, and yes, such gorgeous, retro fabrics. 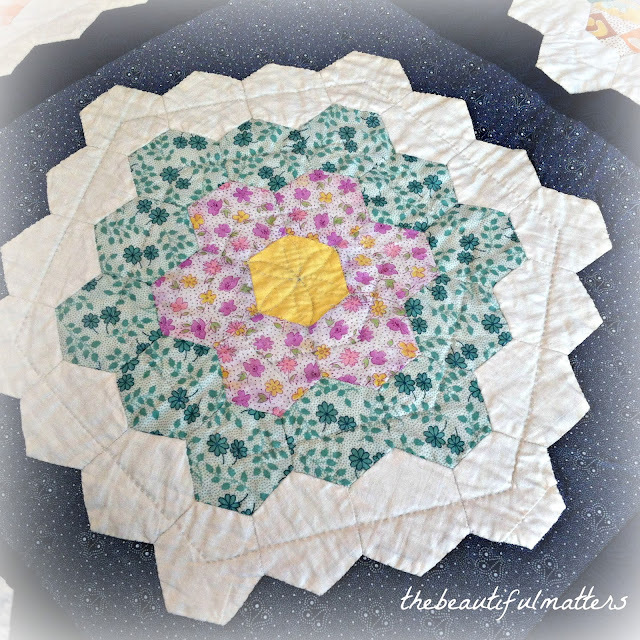 I believe the quilt pattern is called Grandmother's Flower Garden. I'll bet the raspberry cake was fabulous! OMG Deborah ..What a happy family picture... Congratulations....Lucky you visiting Bernideen's teashop ...that's a great excuse for buying more delicious tea ( ha ha)...There's nothing quite as warming as an vintage quilt... H-m-m-m- cosy ...It's special...ENJOY !!! What beautiful memories you have and are creating. My heartiest congratulations to the graduate. Hillsdale College is a very special place on so many levels. I'm a huge fan of their approach to education. All the best to you and your beautiful family. BTW, you look terrific in the photo. Enjoy your delicious tea. You for sure have had a lovely family time; celebrating Mother's Day and having your own Mom around with such a lovely gift. The graduation of your youngest son was the highlight for sure. Such a blessing to have the youngest finish his education. Hi Deborah, I have a quilt in that pattern; my grandmother made it. Precious! Great family photo - you look terrific, Deborah! What a pretty cake. Wow! Have a great week. Congratulations to your son! And to his proud family, and to his beautiful mother! I remember your trip to Bernideen's shop. Your mother obviously knows what you like and that quilt is stunning. I'm so glad you showed closeups of the patches. Weren't the cotton fabrics from those days charming? Your great-aunt was very skilled in her handwork, and in her color combinations. You've had some precious family time! What a lovely quilt and pretty cake! Your tea makes me miss Durango, CO....haven't been a while, Colorado is a beautiful state! Congrats also! Hi Deborah, Congrats to your son on his graduation. What a great family photo together. You are a beautiful family. Love the quilt. All the gorgeous colors with the dark background just pops. The tea looks good and I love the packaging. Oh that cake must have been a real treat. You look great Deborah!! Hi Deborah...the teas look wonderful! I bet they are delicious. I LOVE the quilt! And what a wonderful family group! 71 books??? You're my kinda girl!!! Thanks for your visit and have a great week! That's so fun - Colorado Tea! Thanks for sharing! A lovely family heirloom quilt Deborah and a nice photo from the graduation. Enjoy trying your new teas. A post full of lovely things. Congratulations to your son on his graduation. You look great in the photo. How fun to enjoy tea from across the country. The quilt your mom finished is beautiful, and a family treasure besides. 71 books? Do tell! What a beautiful vintage quilt! I love the old fabrics, and it's so nice that your mom made it up and now has passed it along to you. A wonderful family heirloom. Congratulations to your son! That's a great photo of you all ... and you look fantastic!! 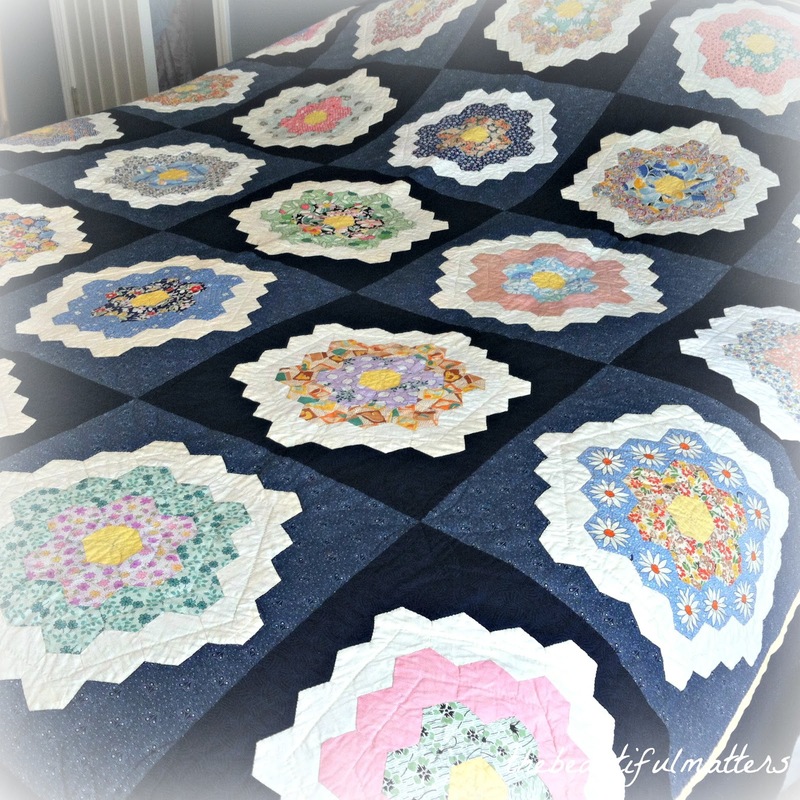 Oh what a beautiful vintage quilt...what a treasure I'm sure you will cherish! I love the old time prints too. Congratulations to your son...great family photo! First of all, you look fantastic. Congrats to your son and I do love the family pic. That tea packaging is just lovely and the flavors sound good. I love the fun 50's fabrics - what a treasure the quilt is. 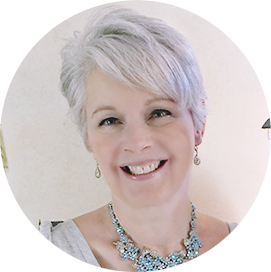 I am so thrilled you visited me this week because now I discovered your amazing blog! I'm sure visiting Bernideen's shop was a fantastic experience. 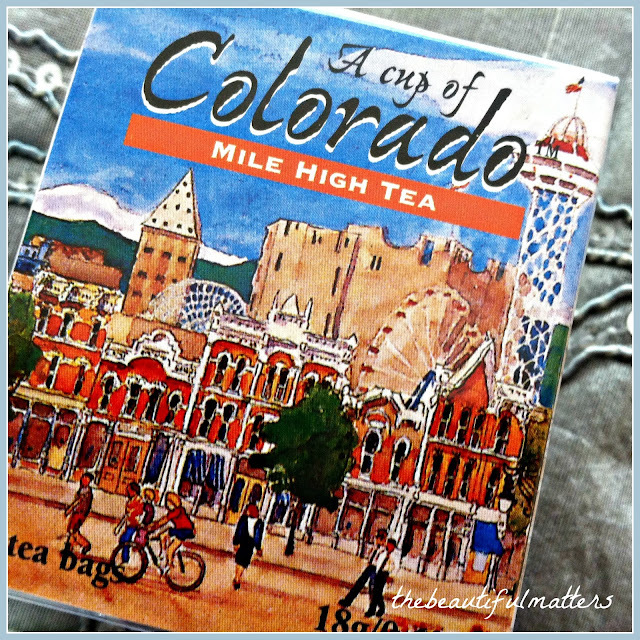 Such creative packaging with the different Colorado teas. I'm in awe of quilters and would love to have their skills. Your quilt is just gorgeous-all of the needlework is so precise and the color combinations are amazing. What a family treasure! Congratulations on your son's college graduation! That vintage quilt from your great-aunt is a real gorgeous treasure! I love it. The tea looks wonderful too. I can see you had a lovely time with your dear mom. Yep, pretty lady; same here, I've had myself a 'whirlwind' of a life lately, I just haven't stopped and just recently I'm coming up to date with my sweet bloggy friends. Not only has it been happy moments, but not so happy ones too. Thank goodness everything is resolved on that end and we can now proceed to enjoy the coming of our new grandbaby from our DD Alex, as he or she will be her first. You look lovely with your wonderful and handsome family. Congrats to the parents for the efforts and support and to the achiever son. Have a great weekend sweet friend. You have a beautiful family, Deborah! And you must be so proud of your son's graduation - that's a VERY big deal! Hope you had a wonderful holiday weekend, I am slowly trying to get back to reading and posting. Your post spoke to me today, as my best friends lives in Colorado. I heard it was such a beautiful state. The vintage quilt that your great aunt made is very nice. How nice that your mom put it all together. My sister sews quilts, and I have always thought it was such a talent. What a treasure that quilt is. And how nice that you got tea from Bernideen's shop! And that cakes looks fantastic! Congratulations to your son, Deborah. What a lovely family photo of the special occasion. All the very best! Many congratulations to your son Deborah, and what a truly beautiful family photograph! The quilt is just amazing, full of love and memories. All those books-I would love to see what you got and so would my younger daughter who loves books too. I love the old quilt. What a treasure. It's so nice that your mother decided to put it together later. Congratulations on your son's graduation from a wonderful college (we read their newsletter). A great family photo! You have a beautiful family, Deborah. How blessed you are! I know you will treasure that lovely quilt, how nice of your mom to give it to you! I bet it was fun visiting Bernideen! I would sure like to some day! Hope you are getting less rain by now! Nice on the books...is it possible to have too many books? I think not. Hi! Thanks for stopping by and commenting..it made me smile. My late husband was the organizer. I let him organize everything. Our canned good were organized to perfection as was everything under our sinks, closets, drawers etc. I'm not that good at it but I manage. I unorganize my closet as quickly as I organize it. It's loosely organized. "Loosely" being the key word. Your quilt is just beautiful. I've only made one in my lifetime and it was king size to the floor and I never made another!! :) When it was finished I needed glasses. Hi! 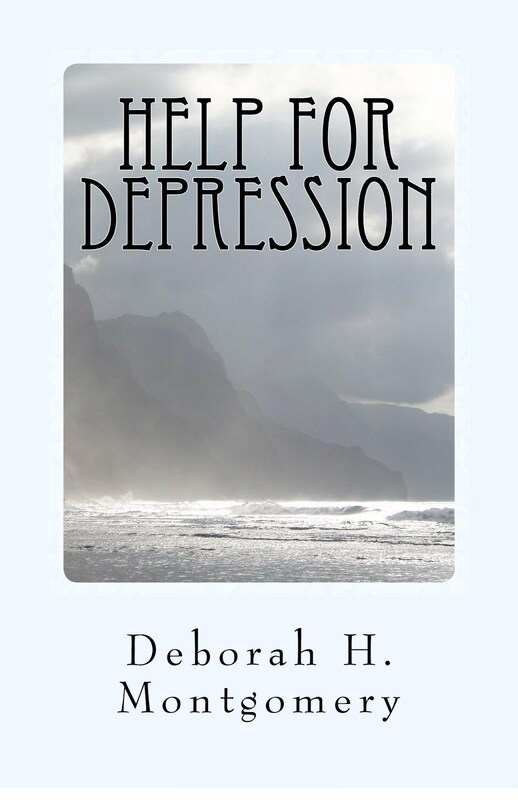 Thank you for your recent visit to my blog and commenting, Deborah. Congratulations to your son on such an achievement! I have two children in college and I know the hard work he had to put in to get that diploma. The quilt is just beautiful! Those little hexies take so much time and how special that it was made by two special women in your life. 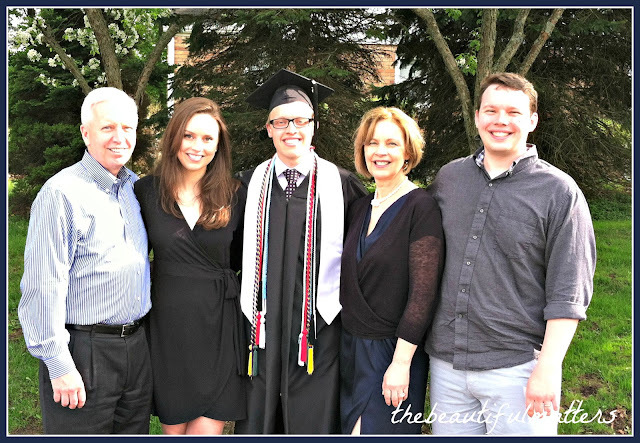 First of all, congratulations on your son's graduation, and especially because he was graduated from Hillsdale College!! Now, back to the beginning: I am a sucker for beautiful packaging. I can already tell that the tea tastes better than any other I've had. Lol. 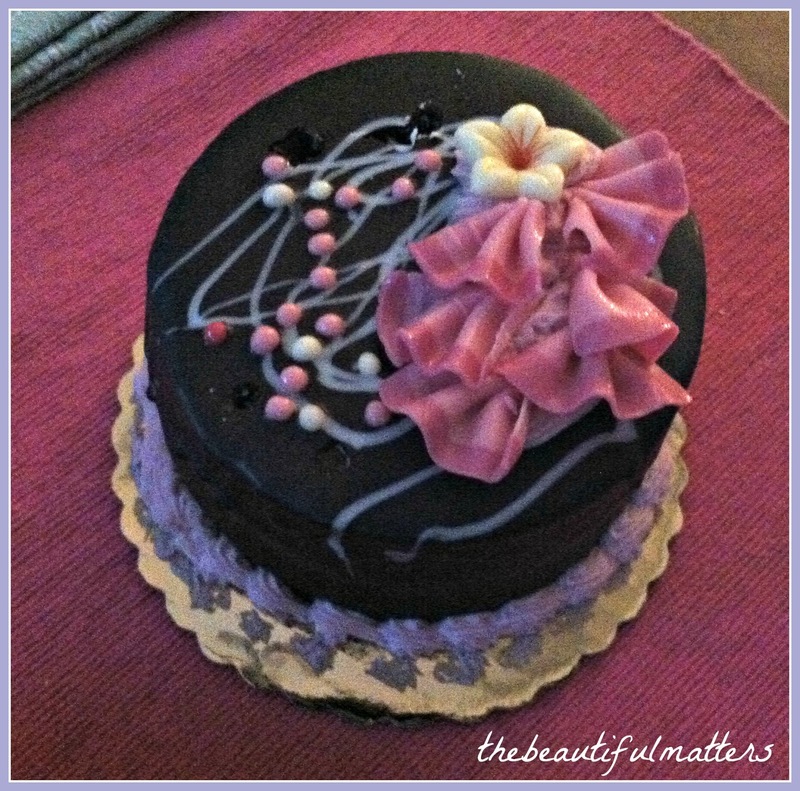 That is a gorgeous cake, and raspberry is one of my favorite flavors. Enjoy that family heirloom quilt. What a treasure! P.S. We get Imprimis too. I have so much respect for Hillsdale and the real education offered there. Deborah, how I envy you that heirloom quilt. Looks like I'll never get a chance to visit Bernideen's tea shop, now that she's retiring. But I'm all about tea! Congratulations on your son's graduation Deborah. That is such a happy and proud time for the family. And you certainly have a beautiful family. The tea looks so cheery. The packaging gets us all the time right. What a nice treat to enjoy however. I also love that gorgeous quilt. You have such a handsome family, Deborah! Congrats to the graduate!! The tea looks awesome! Hugs!